Use a leech for collection. A decent size one will fill a single cartridge, and it injects anticoagulant automatically. It will also apply an anaesthetic at the collection site, so you won't feel a thing. You will need some Stypwool after removal of the leech, though, to stop bleeding. You're taking all the fun out this: no pain, no blood dripping from wounds. I dunno what's the matter with people these days. Sheesh! I was actually thinking of a different anticoagulant, one that would lend itself well to a poisoned pen letter, but probably best not to go there. Blood is a pretty cool alternative, especially if you can get some interesting species. Human blood is a bit of a biohazard. "Written in panda blood" or "Written in lizard blood", would definitely impress. Reptillian blood looks very different than mammalian blood under a microscope. I'd imagine it would be difficult to process into a viable ink though. Anticoagulation is easy enough but it being composed of many different organic and quickly degrading compounds would be challenging. Being biological, I'ld worry about the extremely short shelf life. A compatible surfactant would also be needed due to the general thickness of blood for a fountain pen. On a more positive note, dried blood is known for hard to wash stains so I'ld imagine it would give good water fastness, so there's that. If anyone wants to test it out, please post results ! I forgot to add, Colors ! Chlorocruorin is dichromatic, green in dilute solution and red in concentrated. Sheening ink anyone? I don't want to spoil your fun, but if you're going to do this, do it on a pen you don't care about and is really cheap. I've had to clean weird stuff out of pens quite a few times, and it can be nasty if not impossible to do. Alcohols and solvents can melt some plastics, so can ruin a feed or pen, or both. I've seen the results more than once. I've seen pens fused together as the result of experimentation with stuff other than fountain pen ink. 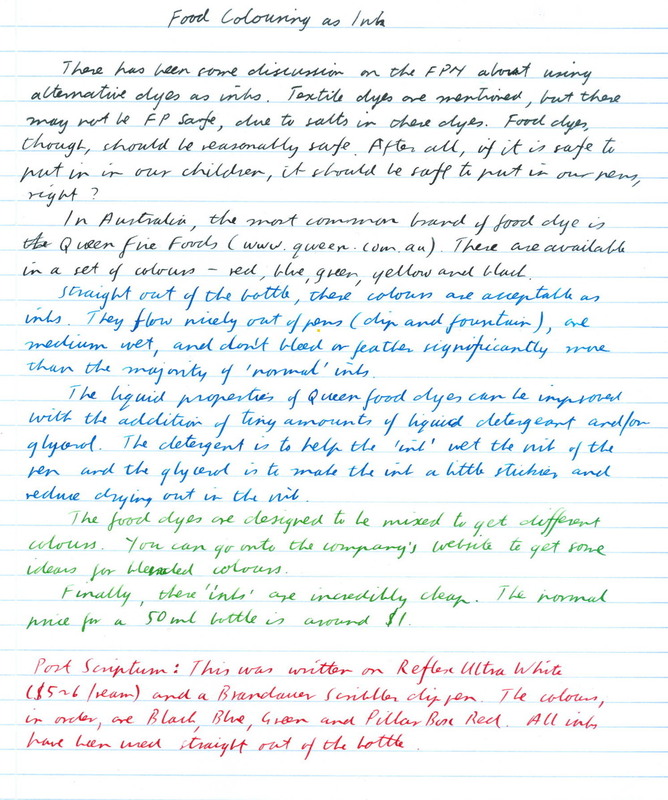 I only used FP ink diluted with water and dishwashing detergent in my Jinhao/Zebra G combo. Works wonders. Isn't that what Platinum Preppys were invented for? Is it disturbing that I am actually considering dipping a nib in blood? If I do, the only dumb animal harmed by the experiment will be me. Warning: do not try this at home kiddies. Disclaimer: as a diabetic I am quite used to sticking needles in myself. So, why bother with just blood, when you can have your loved one preserved in ink. Think about it, my son can say, "I'm writing with mom," and instead of it being that he and I are practicing our penmanship, he can be using my remains in a lovely, supersaturated ink. It's already being done for tattoos. Thank you for that. I was just about to head off for lunch. I usually fill with a 1:1 mix of honesty and verbosity. Edited by Bookman, 21 April 2016 - 15:00. It's okay, I only do this to a couple Jinhao's that didn't "make the cut". None of them have been damaged at all by alcohols. I've seen many warning about using alcohols but modern plastics shouldn't really be affected by them. That said, I wouldn't try using acetone, toluene, turpentine or any known plastic dissolving solvents. Blood doesn't separate by coagulation, nor does blood plasma fluoresce. Adding luminol to blood does make it illuminate because, it reacts with the iron in hemoglobin to chemilumines. In human blood, hemoglobin is only found in the red blood cells so if you separated it would be useless. And, the iron in hemoglobin makes it red so it won't be invisible anyways. Hopes, dreams, shattered. Not at all, quite the opposite really. It's science, sort of. I'm not writing letters to Canada anymore. DCWaites, didn't you fill some with food coloring? I thought my source was bulletproof: "Internet spy manual randomly stumbled upon by googling for something else, 2016"
Edited by Gofixmix, 22 April 2016 - 06:39.